Japanese media and fans on Thursday rained down the superlatives on tennis stars Kei Nishikori and Naomi Osaka who made history by both reaching the US Open semi-finals. “There is no stopping the Japanese players,” screamed the Nikkan Gendai tabloid, after the pair became the first from the country to secure semi-final berths in both singles competitions during a Grand Slam. Particular praise was heaped on 20-year-old Osaka, who became the first Japanese woman to get into the top four at the US Open. The last Japanese woman to achieve a Grand Slam semi-final was Kimiko Date at Wimbledon in 1996 — a year before Osaka was born. “Osaka was in full throttle from the start,” Nikkan Sports said in its digital edition, reviewing her 6-1, 6-1 quarter-final victory over Ukraine’s Lesia Tsurenko. “She has taken a step into uncharted territory for Japanese women in New York,” the paper added. Osaka’s feat was credited with lifting the share price of her racquet producer Yonex, which soared more than 10 percent on the Tokyo Stock Exchange while the headline Nikkei index sank. Meanwhile, Nishikori’s victory over Marin Cilic was seen as sweet revenge for the 2014 US Open final, which ended in victory for the giant Croat. Former world number-four Nishikori, 29, pulled off a 2-6, 6-4, 7-6 (7/5), 4-6, 6-4 victory this time. “Nishikori gets his revenge on Cilic,” said a Sports Nippon headline. 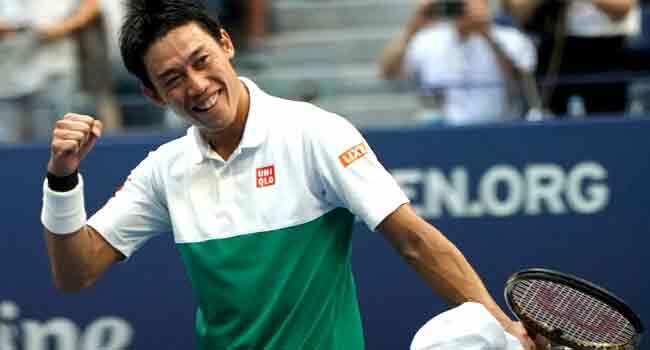 Nishikori next faces Novak Djokovic, while Osaka will play Madison Keys from the US. Excited fans cheered on the Japanese players and allowed themselves to dream about silverware. “Great! I want to see her go against Serena in the final,” said one Twitter user. “Awesome! Nishikori-san and Naomi Osaka get into the semi-finals. Next match is vs Djokovic. Please win,” wrote another.